Nefertari or ‘Beautiful Companion’ has a magnificent tomb comprising an entrance hall (/) with a side chamber (2) leading off to the right. A corridor stairway (j) leads to the burial chamber (4) which has four square pillars and, in the centre, a few stairs leading to what was once the site of the sarcophagus, sunk slightly lower than the ground rock. The walls throughout the tomb are elaborately worked In relief, partly filled with stucco and painted. The first thing that strikes one on entry into the tomb is the extravagant use of colour and its astounding brilliance. The flesh hues, white robes, black hair, bright friezes give the impression of having been newly painted. And the second thing is the realism with which the queen herself has been painted. She is graceful and sensitive and extremely beautiful. Her form, as she appears before the various deities, is accompanied by only a modest amount of text. This, despite the excessive detail of the drawings, gives the impression of simplification, somewhat as though the presence of one so beautiful spoke for itself. On the left-hand wall of the first chamber (a) is a series of magical formulae with the queen playing at a board game. At (b) the ka worships the rising sun between two lions which symbolise the immediate past and the immediate future. To the right at (c) and (d) the goddesses Neith and Selket receive the queen. Maat, goddess of truth, is represented at each side of the entrance to the annex (e). In the side chamber (2) on the right-hand wall (/) the queen adores seven sacred cows, the bull and four steering oars of the sky. 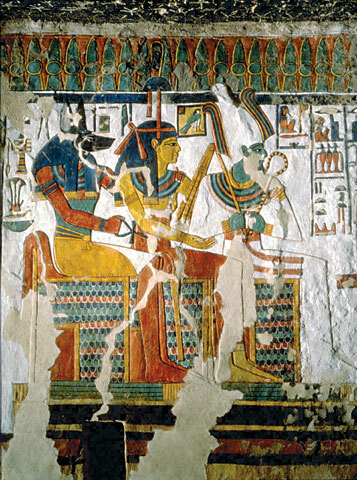 On the facing wall (g) she makes offerings to Osiris (on the left) and Atum (on the right). On the left-hand wall (h) she stands before the ibis-headed Thoth while Heket the frog squats before him. In the staircased corridor (j) Nefertari makes offerings to Isis (on the left) and Hathor (on the right) while guardian deities protect and guide her. The murals of the tomb chamber (4) are not in such perfect condition but represent the deceased queen again with the deities. As usual, demons guard the gates of the underworld and the queen passes by with the aid of the sacred formulae and emblems. In this tomb the safeguards and warnings against evil, and examples of possible sufferings to those not pure in heart, seem to have been used to the minimum. One is conscious of a path of purity through the underworld, as though the journey of Ramses II’s beloved was a mere formality.